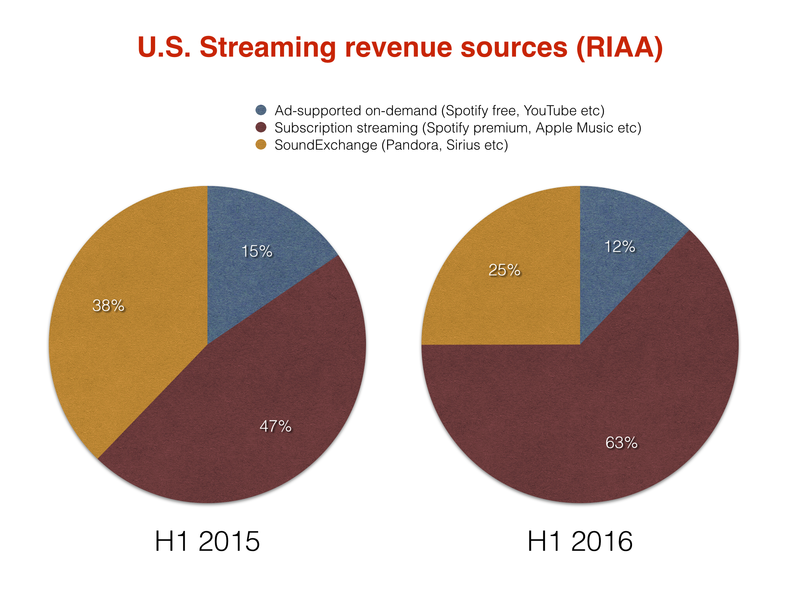 A good news day: Revenue from subscription music services more than doubled in the US in the first half of 2016 – driving overall market growth of 8.1%. The jump in subscription revenue is promising but predictable: last year’s figures barely included cash from Apple Music, which launched on June 30, 2015. Largely thanks to that launch (as well as Jay Z’s Tidal), the value of the average paid-for US monthly music subscription has gone up: from $8.77 in the first half of 2015 to $9.23 in the equivalent period of this year. 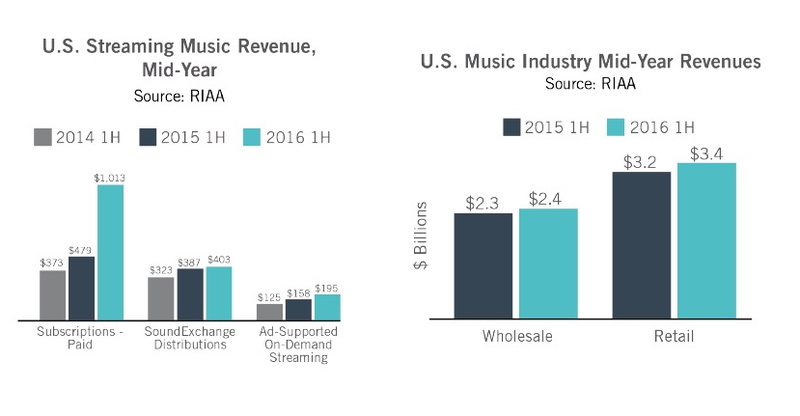 At the same time, the number of people paying for a subscription music service in H1 2016 grew 101% to 18.3m, up from 9.1m the year before. 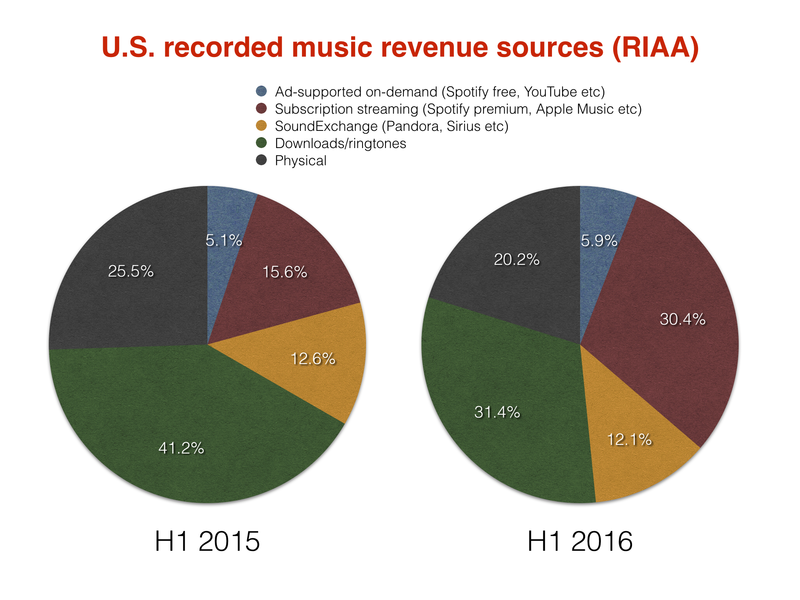 Total six-month US recorded music industry revenues jumped up by more than $250m to $3.43bn on a retail basis in H1 2016. On a wholesale basis – ie. purely in terms of cash flowing through to labels and artists – the market grew 5.7% to $2.4bn in the period. Total streaming revenues across H1 2016 – including ad-funded interactive and non-interactive services – grew 57% to $1.6bn, accounting for 47% of overall industry revenues. Not every streaming stat within this figure was worthy of the ticker tape, however. Revenue from ‘free’ streaming services, including Spotify’s ad-funded tier, YouTube and Vevo, grew 24% to $195m – less than a fifth of the cash generated by subscription. Non-interactive revenue distributed by SoundExchange – primarily from Pandora – grew, but very slightly: up 4% to $403m from $387m in H1 2015. 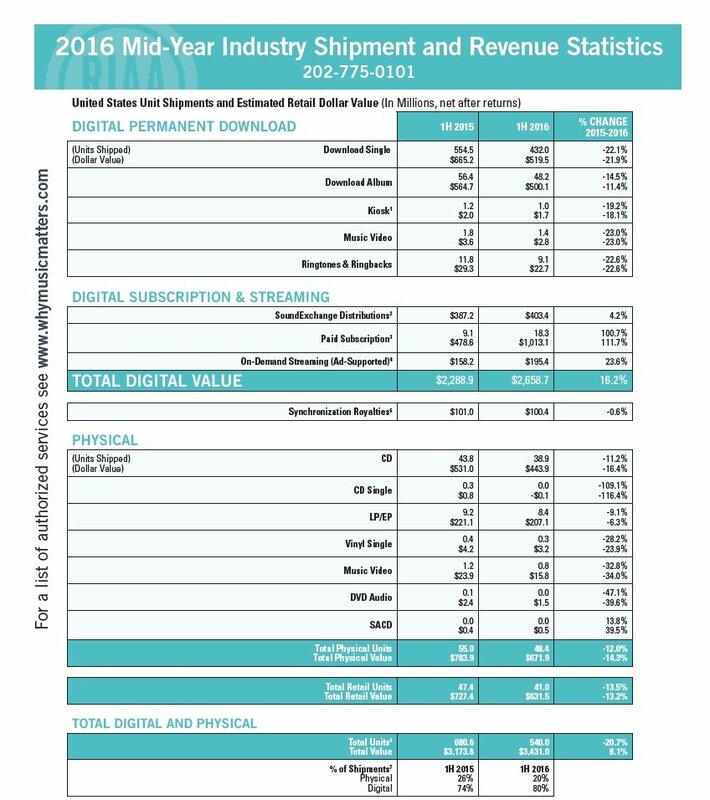 Revenues from permanent digital downloads (including albums, single tracks, videos, and kiosk sales) declined 17% to $1.05bn for the first half of 2016. The total value of digital albums was $500 million, down 11% versus the same period the prior year, while digital album units were down 15% to 48.2 million. Digital track sales declined by value 22% to $520 million, with sales volume down 22% to 432 million units. Interestingly, that means the amount spent on the average digital album download ($10.38) and the average digital track download ($1.20) both increased on H1 2015. CDs made up 66% of total physical shipments by value, with CD album revenue falling 16.4% to $443.9m. Vinyl album (LP) and EP sales were down 6.3% by value during the first half of the year, to $207.1m. Synchronization royalties were $100 million for the first half of the year, virtually flat versus 1H 2015.